2.1 Below you’ll find our pros for this online sportsbook. When it comes to sports betting in Ireland, William Hill is a great choice. Their reputation is recognizable around the world and they are one of the most popular betting brands in Ireland. In our BettingTop10 review, you’ll find everything you need to know about this bookmaker including odds, live betting, in-play betting options, sports covered, how their website works, customer support, and more. Plus if you open an account today you get a sign up offer worth €100. When it comes to pros and cons, every sportsbook has them. The William Hill online sportsbook is modern and very easy to navigate. When you visit the homepage, you will find a list of menus at the top of the screen under the Sports tab. The main sports are highlighted at the top and include Football, Horseracing, Tennis, Greyhounds, Cricket, Virtual World, and the More Sports tab. Underneath these you will find more sports to choose from including eSports, TV/Specials, Winter Sports, American Football, UFC/MMA and more. In total, there are 24 categories to choose from. Under these and highlighted in yellow, you will find In-Play Betting, In-Play Schedule, WHTV Live Streaming, Radio/Postcasts, Tip Advisor, Promotions, and Betting TV. The middle of the homepage displays all of the action that is happening right now. The first section is the Bet Live In-Play now section and this highlights what sports are currently available in the Live In-Play portal. Underneath this is the Match Highlights section, and under this is the Daily Racing Podcast links. The right-hand side displays your betting slip and there are tabs for Open Bets and the Tip Advisor. It’s easy to find what you’re looking for and currently promotions are prominently displayed on the right-hand side of the home page too. There is plenty of information for all players and the site is fully mobile optimized too. William Hill mobile betting is available for all Irish punters and the apps is excellent. It is available for iPhone, iPad, and Android smartphones and tablets. 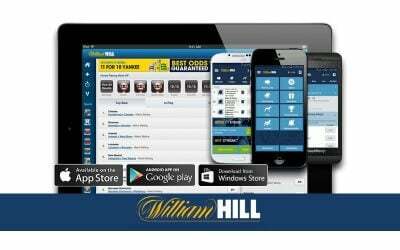 It can be downloaded from the relevant apps stores or from the William Hill website. It has been referred to as the quickest sports betting app on the market and everything you need can be found right in the palm of your hand. Placing bets is easy and you can navigate through all the sports with ease. There are extra features too such as Racing post stats. User have access to all the website features including live betting and the in-play ports. It’s easy to redeem bonus offers, check our account balance, and place bets on the go. William Hill Ireland offers betting odds that can be displayed in fractional or decimal and odds are offered on over 30 different sporting events. These include horse racing, golf, football, rugby, tennis, cricket, and more. There are various specials too, including eSports, odds on The X Factor, Strictly Come Dancing, Sports Personality of the year, Oscars, and more, as well as a small number of futures and prop betting options. Live betting is available 24/7 and they stream more than 60,000 events every month. The in-play betting options are excellent and Irish punters can bet on games as they play out live on their PC or mobile device. The live betting odds and option are great and bets can be placed on the next goal, first half score, etc. In the In-Play portal, bettors can choose from the live matches or the upcoming schedule. There are lots of markets and betting options and these update as the game progresses. The live streaming section of the website, WHTV is free for logged in users subject to broadcaster territory restrictions and the sports include UK, Irish and South African horse racing, greyhound racing, football, tennis, cricket, snooker, ice hockey, darts, basketball, handball, and volleyball. William Hill uses top of the line betting Playtech software and all their sports are clearly visible for Irish punter at the top of the homepage. Betting markets are displayed in the middle and placing bets is very easy with the betting slip on the right hand side. The website is easy to navigate and the Playtech software is faster than most other sportsbooks for Ireland. The Playtech BGT Sports software covers all sectors and includes mobile and online products. It has been designed to deliver excellent and has been named the best in-class sports betting technology solution on the market today and is perfect for large sports betting operators. The software is fully customisable and allows operators to create banners, bonus offers and manage target group. Smart pricing is also included as is the integration of customer loyalty cards, payment services, and more. The software is one of the best when it comes to horse racing and all the big race meetings are covered with early prices available for all UK and Irish race meetings. Playtech has also teamed up with the Racing Post to create a new racing interface that has been built by experts. The addition of the Racing Post application provides users with insight and information such as age, weight, jockey, trainer, etc, as well as exclusive Racing Posts tips. When it comes to managing your William Hill betting account, there are plenty of payment options to choose from. These include debit and credit cards with deposits from as little as €5. E-wallets are also accepted and include Neteller, Moneybookers, and PayPal. The minimum deposit for e-wallets is €10. Bank transfers can also be done but these take up to 72 hours to process. Withdrawals are fast and can be processed in a matter of hours. The maximum withdrawal amount is €99,000. Withdrawals must be made using the same method you used to deposit. If the deposit method doesn’t allow a withdrawal you will be given the option to use bank transfer. If you have used more than one payment method on your account, you must withdraw to the method you’ve deposited with the more. Step 2: Choose your payment method from the list and add the required details. Step 4: Your deposit will be made and your account balance updated instantly. Step 3: Choose your payment method and add the required details. Step 4: Click deposit and your balance will be updated. There are so many William Hill promotions for bettors to choose from. When you sign up for an account you can claim the welcome bonus which Bet €10 and Get €20 Free Bet. To claim this all you have to do is register and use the promo code F20. Place a €10 sports bet at odds of 1/2 or greater and you will receive 2x €10 free bets. There are wagering requirements and terms and conditions, so be sure to read these. There are plenty of William Hill promotions for regular bettors too including, Drive 55 where bettors get a 15% free bet bonus if there are 55 points or more in the game. This promo is for NFL games. High 5 is the promotion where bettors get a 15% bonus on their winnings up to €100 on horse racing if the horse they back wins by 5 or more lengths in selected UK and Irish jump races. William Hill also offers the best ever ACCA insurance available across all sports and selected markets. If one leg of your five fold accumulator lets you down, they will give you your stake back as a free bet. The minimum odds of 1/5 for each selection applies. There are enhanced odds on a huge range of markets and with the Cash in My Bet option you get to take control of your bets. Visit the William Hill promotions page for more information on all the great promos and offers that are available. Having good customer support is essential and William Hill excels in this area. They have support available 24/7 via their support page https://williamhill-lang.custhelp.com/app/ask and you can connect with them in several ways. William Hill is a great bookmaker for Ireland. They cover all the popular sports like horse racing, golf, and football. The sign up offer is 100% up to €100 and there are plenty of promotions running all the time such as a free €5 bet every week. The terms and conditions are fair too. The website is packed full of information including new offers, tips, online games, best odds, stats, promo codes, virtual games, and more.